Our internet has been on the fritz lately, and while we’ve got a patch of connectivity I’m going to rush and get this post out, so here’s some show and tell! 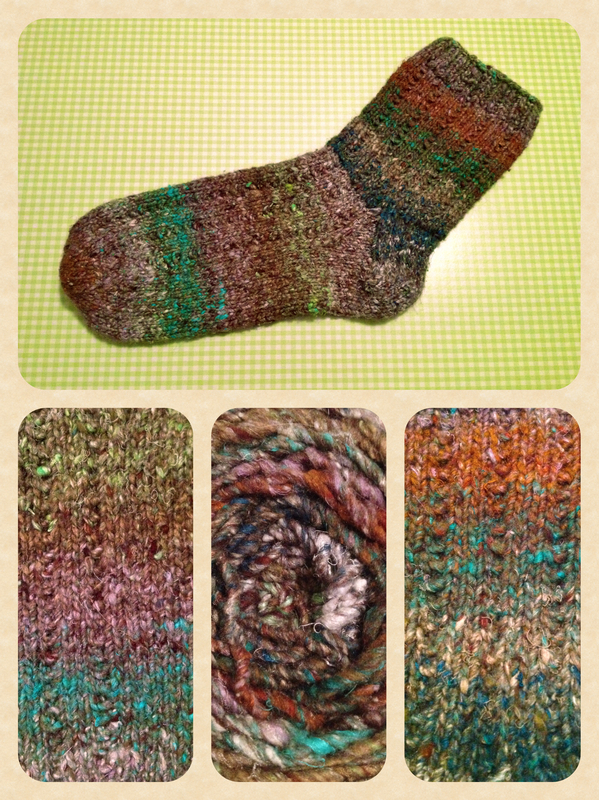 First up is the first sock I’ve knit of the Thuja pattern from Knitty.com which I’m pretty pleased with. My friend has GINORMOUS feet! 32cms from heel to toe. Oy. I’m so glad I’m knitting thick, wooly bedsocks and not regular socks with sock yarn. Behold the enormous foot sack! The next main focus has been a hat that is proving to be a vexation to my spirit. My friend, Jeanette, was knitting a pattern called Dartmoor, and it looked so amazing I wanted to do it too, so she gave me a copy of the pattern. I started it in a blue and green Crazy Zauberball, and I accounted for tension and followed the pattern closely… but it just didn’t feel right. The next time I saw Jeanette, she’d finished her Dartmoor, and while it lookedamazing, she was somewhat disappointed because it had turned out more of a beanie than a tam. I decided I’d keep going and see, but the same thing started happening with mine. I checked on Ravelry and it seems everyone who’s done this pattern has had the same problem! I frogged it, and started again (taking the opportunity to change to a different colorway Zauberball) casting on a buttload more stitches. Still, it just didn’t feel right, and I thought maybe it was because I was working on DPNs. So, I ripped back to the ribbing and started again on my Takumi interchangeable circs, and this time – touch wood – it seems to be working out. 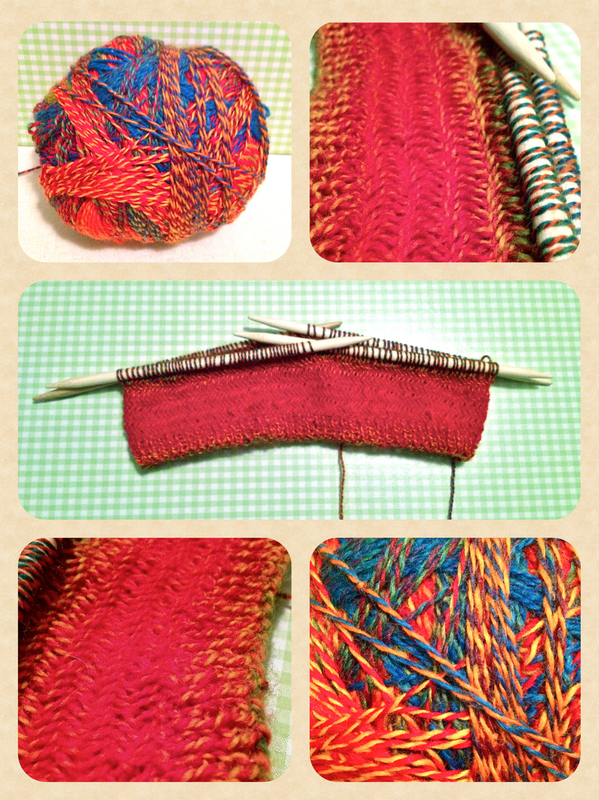 I think it’ll still be more of a beanie than a tam, but the herringbone stitch looks divine. I do love the texture of the herringbone stitch. It’s well nice. These pics were taken before I ripped it back to the ribbing and started again with my circs, so it looks much better now. I’ll tell you this much, if I have to frog or rip back this sucker one more time, I’m going to have a serious stampy tanty. Not even lying. In less troublesome news, I popped into my favorite store in almost the entire world, Tokuya, after work one day and picked up some goodies. Tokuya is a Japanese hyaku-en store (100 yen store – like a dollar store, but a million times more awesome), and I try not to go too often because it’s literally impossible for me to leave without buying at least one thing. We do NOT need any more bento boxes, but we all know I haven’t yet bought my last. 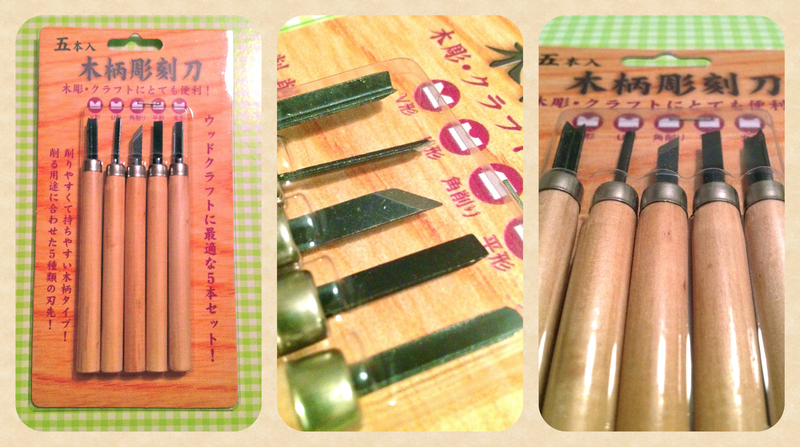 Anyway, I bought this little set of lino cutting tools because it has some blades that my other sets don’t have. Can we just have a moment to acknowledge the fact that they even have linocut tools!? I mean, I can’t read the kanji and all I can pick up is the word “craft”, so they may not even strictly be linocut tools, but some of the blades are identical to some I already have, and they suit my purposes, so GO ME! I’m a happy chappy. 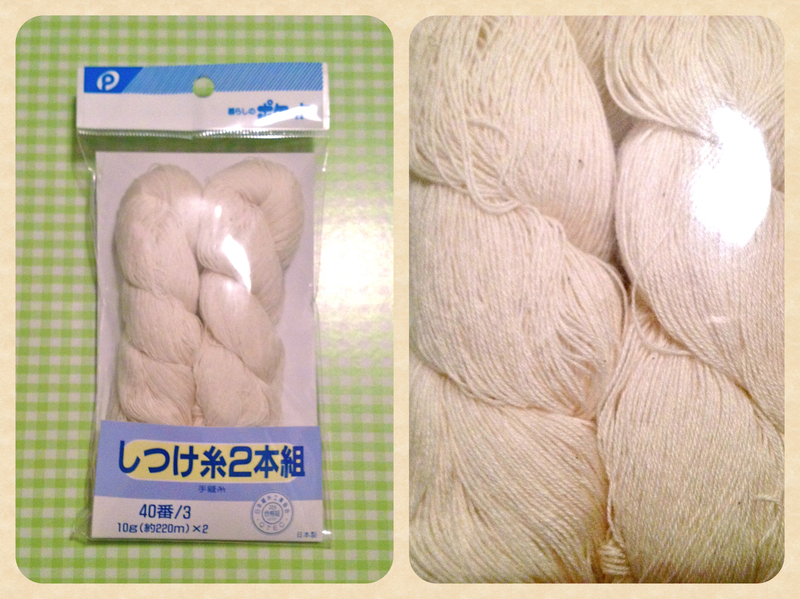 Then I bought this crazy fine thread. We all know this is going to make my eyes bleed. I have two potential plans for this, but I’ve yet to decide which one I will go with. I either want to do some doily work in the round, or design a cheeky filet crochet pattern. It might be a huge disaster on account of my giant tree-trunk fingers and my less-than-perfect eyesight, but I can’t resist. Well, I’m going to go ahead and post this before the internet gives me the stinkeye yet again! Love your lovely faces! Eek, that thread is super fine! And those socks are gorgeous! I vote for filet crochet- love the geometry of it. Haha! Behold the enormous foot sock-love it! Wish i could knit.Well i can but the last time was 30 years ago and i knitted a cardy one side longer than the other for my hubby.I was hurt for 1 second when he did’nt wear it…How can your tree trunk fingers(you said it !) knit such lovely fine things? I’ve got a box of colourful wool-just so i can look at it and feel happy…. Eh? 23cm is not a big foot, mine are 25cm = ladies size 9. Was that a typo? Did you know that in Japan they size shoes by the length of your foot, ie I’m size 25 in Japan. Such a sensible system! I’ve had many irksome projects! I knit the yoke decreases on my Coraline 3 times! But it’s finished now and worth it! I went back and corrected it! Thanks for catching that! The Japanese are unfailingly sensible! I love them so much. Wow, I love the colours in the yarns for that sock and your tam/ beanie! ^_^ I am so keen on the idea of the hyaku-en store; I will have to try and find one here in Perth! Time can be the difference between an irksome project and a pleasant one, can’t it? I have so many projects – with deadlines(ish) no less! – so all of mine are a bit irksome at the moment. Oy. There is nothing more irksome than knitting two left gloves. Love Tokuya! Love the socks! We should do a hyaku-en store haul! Daiso, Fuji-Mart (not really a hyaku-en store, but still) and Tokuya! Make it so.